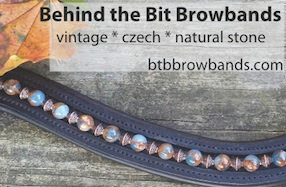 Behind the Bit: BTB Browband giveaway! To celebrate my 100th like of Facebook, I'm giving away the very first browband I ever made to sell. It's actually a lovely browband and I'm surprised it hasn't sold. I'm also giving the winner the option of taking this natural stone eartone browband, or this blue postermodern design instead. All are 16" curved style. Thanks to all who have taken an interest! To enter: LIKE my BTB Browbands Facebook page and leave a comment either on FB or on my blog with your contact info. Sorry Teresa, instructions now provided. I need a way of contacting you (comments or on FB) and like my BTB Browband page on Facebook. Thanks! Off to "like," and I really do like! This would look lovely on my sorrel-looking red dun dressage mustang! I don't have Facebook so I can't enter, but its a beautiful browband and I'm really surprised no one has snapped it up yet! A beautiful browband. Liked your page and hoping you get many likes for your lovely work. Stacey, your work is beautiful! The brow band would look stunning on Nikitos, who is a gorgeous chestnut! Love this! It would look great on my bright chestnut with flaxen mane and tail. Wow. Your work is really stunning. Good on you for making these, I wish I could buy several!